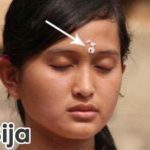 “WHAT IS BIJA IN HINDUS”? In every Hindus ceremony, the Hindus people will pray as a symbol of gratefulness to the God. There will be some offerings when Hindus people praying, such as Banten, flowers, fruits, etc. And after they finished, they will get Tirta and Bija. Might be some people (not Hindus) has a question when they see a rice in the forehead of Hindus people. “What is this?” (While they pointing the rice in the other people’s forehead). Mawija or Mabija is the last series in a prayer ceremony. Here is the detail of “What is Bija in Hindu”? Wija (Bija) in Sanskrit is called Gandaksata which comes from words Ganda and Aksata which means whole grains and fragrant grains. Wija or Bija is usually made from rice seeds which are washed with clean water or sandalwood. Wija or Bija is the symbol of Kumara, the son of Lord Shiva. In essence what is mean by Kumara is the seed of Shiva or the character of Lord (Kedewataan Character) which is like to forgive, firm belief, noble wisdom, not jealousy, not arrogant will resides within everyone. Mawija means to develop the Siwa’s seeds in people. So it is recommended that you can use Galih rice, which is whole rice, not broken (Aksata). The scientific reason is that broken or cut rice will not grow. It seems like Bija, if the rice that uses are broken, the Lord Character will not grow up in the body and soul of Hindus people. Between two eyebrows called Anjacakra. Actually, it is more precise, slightly above, between the two eyebrows. The most common thing we see. Inside the mouth or ceiling. 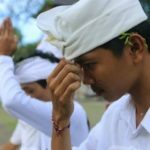 In the neck, outside the esophagus or throat is called Wisuda Cakra. At Anja Cakra, a little above, between two eyebrows. In the mouth, swallowed immediately do not be bitten or chewed. The reason for this is that if you chew the rice it will break and finally the growth of human maturity does not develop. And then the amount of Bija that must be placed in the three divisions should be a multiple of three because “three” is sacred and mystical numbers, three, six, and nine and so on. Understandably, if there is no chance to count the Bija, then it just takes for one small jump of fingertips.